The Blackmagic Design Teranex Mini SDI to HDMI 8K HDR is more than just a basic converter, it is also an advanced 8K monitoring solution. The four 12G-SDI inputs support 4K signals independently and can be ganged together to support an 8K input signal, either DCI 8K or 8K video split into four UHD signals. It can use third-party calibration probes such as the SpectraCal C6, X-Rite i1 Display Pro, or the Klein K10-A probe to accurately align connected displays for precise color. The built-in LCD screen displays not only the video image, but it can also display two on-screen scopes that can be selected between WFM, Parade, Vector, and Histogram. The 8K is available on the four SDI outputs, or via the four HDMI outputs for monitors that support quad HDMI inputs. 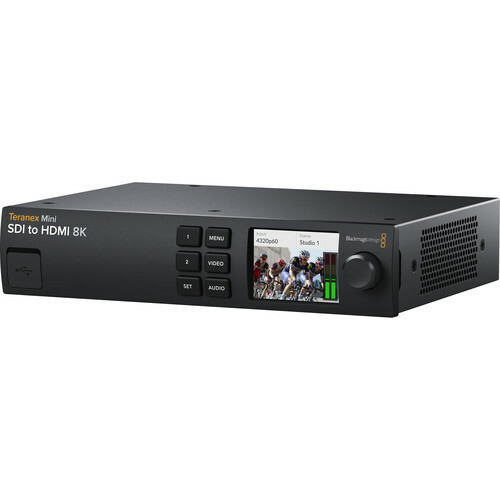 If you are not connected to an 8K monitoring solution, a built-in down-converter enables you to display the 8K input video on an Ultra HD or HD monitor. The unit will convert between 2SI and square division automatically. The Mini SDI to HDMI 8K HDR solution supports a variety of HDR workflows, including, PQ and HLG, and it supports both Rec. 202 and Rec. 709 as well as 100% of the DCI-P3 format. Two independent 3D LUTs can be loaded at the same time, and you can switch between them from the unit's front panel. In addition to the LCD video screen, the front of the unit features a rotating selection knob and six front-panel buttons for navigating the unit. The quad-link 12G-SDI inputs have outputs for looping to other equipment. In addition, all HD, Ultra HD, and 8K standards are supported, allowing broadcast or film industry use. With 2SI to square division conversion built-in, an 8K source will be automatically converted for the monitor. Teranex Mini SDI to HDMI even handles both Level A or B 3G-SDI plus YUV and RGB SDI formats. The Blackmagic Design Teranex Mini SDI to HDMI 8K HDR can use third-party calibration probes (not included) such as the SpectraCal C6, X-Rite i1 Display Pro, or the Klein K10-A probe to accurately align connected displays for precise color. Just connect the probe to the unit via the USB Type-C connector on the front panel, and start the calibration process in the menu. The front-panel LCD provides confidence monitoring with both images and accurate audio level meters. There are menus for all functions and it's easy to scroll through the menu pages to find settings that need changing. The 3D LUTs can be enabled just by pressing the 1 or 2 buttons. Calibration is also started via the menus and you simply follow the prompts to calibrate your display. The audio meters can even be switched between VU or PPM ballistics. HDMI instant lock can be enabled to ensure the HDMI display locks instantly if the input video is interrupted. There are settings for configuring scopes, their on-screen location, or opacity. You can even view and edit network settings. Teranex Mini SDI to HDMI 8K HDR includes the same high-quality, 33-point 3D LUTs as used in the film industry. 3D LUTs are perfect for recreating the look of old-style film stocks, or they can be used to compensate for the colorimetry of the connected display. You can calibrate the connected display by connecting a third-party USB color probe, and Teranex Mini SDI to HDMI 8K HDR will analyze the monitor and generate a 3D LUT to correct for color differences between displays. Two independent 3D LUTs can be loaded and you can select between them from the front panel. Plus, 3D LUTs use standard file formats so you can load LUTs generated by software such as DaVinci Resolve.